The annual show has come around. We decided to put a carton of our mini cos in the produce section. And a couple of punnets of our heirloom cherry tomatoes. “I’ll be disappointed later if we don’t.” my never standing still, hard working husband said. We carefully selected 12 of our lovely little cos, picked and packed them nicely, their leaves a sea of fresh, vibrant green in the brown box. We misted them with water to keep them fresh, loaded them in the back of the car and drove them into the local Show. Unfortunately there wasn’t an ‘organic’ section. So we put them in with the conventional produce. We drove home and left our babies in there with the multitude of other pieces of fruit and veg to be judged. 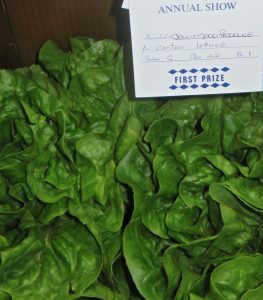 The next day our daughter searched them out first and stood there pointing excitedly with a big smile on her face…..”They’ve got 1st“…she tried not to be too noticeable as other show goers milled around looking at all the produce. The continual heat lately has been unusual and quite horrendous for growing lettuce. All our large cos have bolted or gone a waxy look. Our fancy lettuce aren’t looking too fancy! Losing overnight what were lovely rows of green produce, almost ready to sell, is very disheartening after so much cost, care and work. It is frustrating and discouraging to have to contact customers and tell them that we can’t supply this week due to elements out of our control and even worse to have to plough them back in. The ground had been prepared, the little seedlings planted, then nurtured and watered as they flourished…until the heatwave. We were thankful to have something lovely to display and it was encouraging to receive a 1st. Smooth, juicy, shiny black balls clumped together. Growing in the Summer sunshine. Anticipated at the end of every January. First the little white flowers. “The Blackberries have flowers!” the kids whoop. And finally someone comes in with the first blackberry, like the dove coming back to the ark with an olive leaf. It is a promise of good things to come. But the good things come at a price. The blackberry bushes are very spiky, catching on everything they can get their little snares into. Even the leaves are prickly. But the prize is worth it…or they wouldn’t go back year after year to fill those mouths and containers. Finally the day comes when they troop off with containers, hoping to find enough berries to make a Blackberry Cobbler. Now a family tradition which we look forward to every year. To keep it special I only make the cobbler when the Mulberries and then the Blackberries are in season. It is an adventure they look forward to from the time they spot the first flowers. They bring in a cupful. Not enough. So they rally up some friends and bring in a container full of the juicy little berries…..the ones that have made it past their mouths out there in the sunshine. I gauge the amount. A few cupfuls. That should do. We mix the berries in rapadura sugar and leave them. The sugar draws out the juices in the berries, creating a berry syrup. I dig out my Blackberry Cobbler recipe and soon the kitchen is filled with the wafting aroma and warmth of pie baking in the oven. It is one of those very special moments when the warm cobbler is served up with pouring cream drizzled over it. Sighs of satisfaction fill the air as appreciative mouths and hearts savour the moment of eating homemade Blackberry Cobbler!